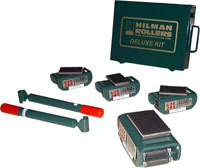 Hilman Rollers Deluxe Kits or Prepackaged Complete Sets are ideal for all kinds of heavy equipment moving, machinery installation and maintenance. Kits include everything needed to make those heavy moves: (4) professional quality Swivel-Locking Rollers* and two full-length Steering Handles in a sturdy, heavy gauge steel storage case. Complete sets contain the same rollers and handles but are provided without the kit box. Each roller kit offers a different degree of versatility and range in capacities. With or without a kit case, these prepackaged kits or sets are the value leaders of the Hilman Roller line. Click the models below for more information. FT Series - FT Series Hilman Rollers have three versatile top plates. "D" tops have a spike-like steel grid able to grip into wood and provide a secure move for crated or palletized equipment. "P" tops, with built-in neoprene pad, allow some compression and provide a non-slip surface, a versatile choice for moving on less than perfect floors or for moving metal based machines. "S" tops have smooth steel top, ideal for mounting the rollers to equipment or as a base unit for a variety of top modifications. ERS Series - Hilman's ERS rollers are the lowest profile high capacity rollers in the world! Utilizing the endless chain concept, the basic individual ERS Roller is designed for straight line motion, yet each can be outfitted with a removable swivel attachment for turning and positioning. Capacities up to 100 tons. Easy and safe to use! Just lift the load, set the Rollers, and move. The recirculating chains on the Hilman Rollers provide controllable heavy moving, right on ordinary concrete floors. Fully directional swivel tops allow equipment positioning in the tightest quarters. The 3 and 8 ton Kits and Sets feature Swivel Padded Rollers. The 15 ton and higher Kits and Sets are available with your choice of Swivel-Locking Padded Rollers or Rollers with Swivel-Locking Diamond steel grid tops and loose Preload Pads. Available in 5, 10 and 25 ton capacities. 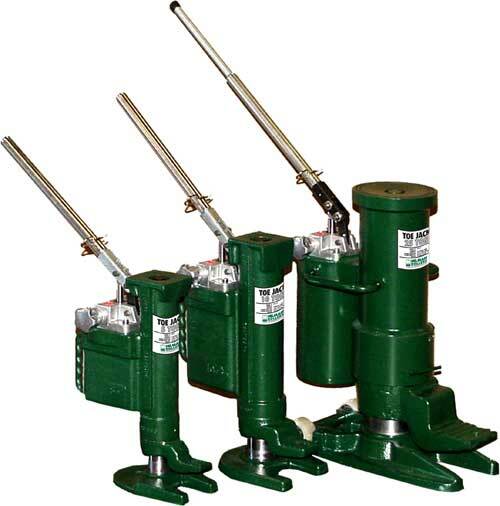 Hilman Toe Jacks allow you to get under and lift equipment with just over 1" of ground clearance (1.06" to be exact) and since there are lifting points on both the toe and the top of the jack these are the perfect complement to Hilman Rollers. Our Toe Jacks all comply with ASME B30.1 standards and include pressure valves to prevent overloading. In addition, they can operate both horizontally and vertically. Since the base, toe and pump assembly swivel completely independently of each other, you can fit the jack in confined spaces. Of course, these Toe Jacks come with Hilman's famous quality reputation.